Two serial entrepreneurs are going “back to the future” to open a corner shop with a difference in Hull’s Fruit Market urban village. 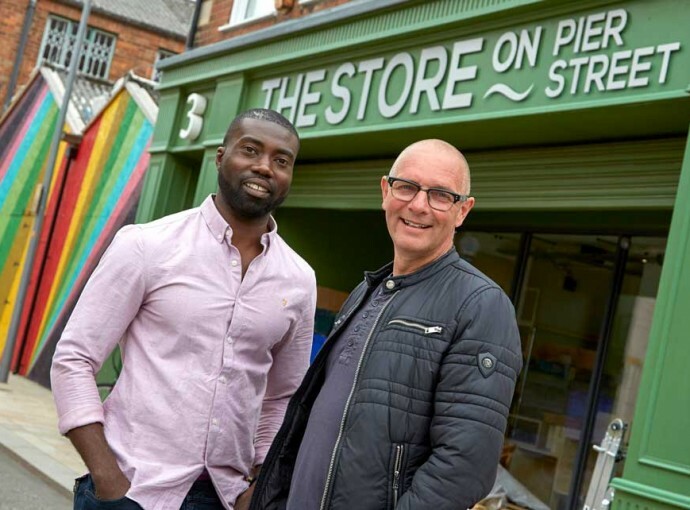 Retail and tech pioneer Jonathan Elvidge has joined forces with Phil Benson, who has run a series of drinks, food and catering businesses, to launch a new venture combining convenience and service to the community. The business partners said they had felt for some time that the fast-evolving Fruit Market area needed a store providing essential items for its ever-growing community, so they decided to open one themselves. Now they’re launching The Store on Pier Street, in ground-floor former fish filleting premises off Humber Street in the heart of the Fruit Market. The new store will be welcomed by the hundreds of workers now based in the resurgent waterfront area, which has become a vibrant new community, featuring independent, creative businesses, restaurants, bars, galleries and shops. It’s also perfectly timed with the first homes taking shape in a development creating a new residential community amid the Fruit Market’s cobbled streets. Customers of The Store on Pier Street will be able to buy locally-sourced fruit and vegetables, bread, milk, eggs, meat, fish, cured meats and cheeses, including organic produce, as well as larder items such as soup, beans and oils, and kitchen and bathroom essentials. The shop will also stock a limited range of high-quality ready meals for time-pressed workers to buy for lunch or dinner, as well as craft beers and speciality wines and spirits. The store opened on July 5 and has created four full and part-time jobs. Mr Elvidge said: “We love the Fruit Market area – there’s a real energy about the place and it’s great to be part of it. This feel like a missing piece of the jigsaw. 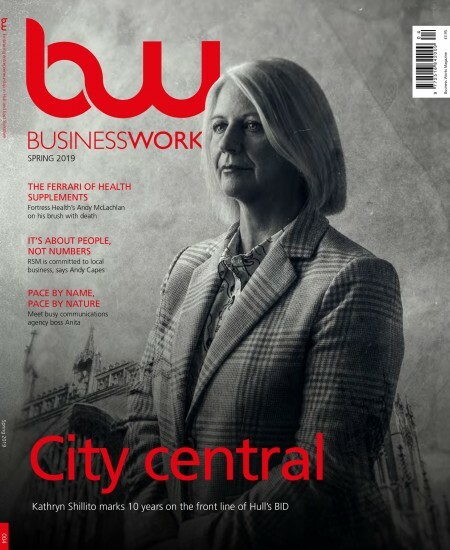 “Our thinking was ‘there’s a real need here and everybody’s talking about it, but nobody’s doing it, so why don’t we?’ Between us we have a combination of retail, hospitality and customer-facing skills and experience, so why not bring them together? “This concept feels like a really natural fit and the time is right with lots of new residents moving into the area soon. The venture marks a return to retail for the Hull-based entrepreneur, who made his name as founder and Managing Director of the Gadget Shop. Mr Elvidge launched the Gadget Shop with one store in Hull’s Princes Quay shopping centre and, at its peak under his management, it had 45 branches across the UK. Among other ventures, Mr Elvidge later returned to the gadget retail sector by co-founding Red5, which was sold recently in a multi-million pound deal. Since then he has shifted focus and become a Director and co-founder of health tech start-up Moodbeam, based at the Centre for Digital Innovation (C4DI) tech hub in the Fruit Market. Moodbeam is developing a wearable device to track moods and provide valuable insights into mental health and wellbeing. Mr Elvidge added: “The Store on Pier Street makes me smile because I’ve abandoned high street retail. The old retail model has been largely replaced by online. Mr Benson brings a wealth of experience in the catering and hospitality sector to the business. He was the co-founder of Xing Smoothies, launched the Shambles Kitchen street food outlet in York, owns The Drinks Flight corporate hospitality and events business, and ran the café and catering operation at Humber Street Gallery during Hull’s year as UK City of Culture 2017. He said: “We’re offering something new – it will have elements of a traditional farm shop, merged with a convenience store and off-licence offer, which makes it more interesting to visit and browse. “It’s a traditional model, but done in a different way. In many ways it’s back to the future and reflects how things have come full circle. “There’s a yearning for community and social interaction – things that make us feel good. Our wellbeing is being diminished because we don’t have these interactions. I’m an advocate for technology because it does wonderful things, but it also has its limitations. The Store on Pier Street will be open initially from 7am to 7pm seven days a week. The 1,000 sq ft shop will have an “urban chic” feel with exposed brickwork, iron ceiling beams and natural woods, with goods displayed on crates and in baskets. Mr Elvidge said he and Mr Benson had formed The Store On Limited with a view to the concept potentially rolling out to other communities around the country. He added: “Originally we thought this was just about doing something for the local community that we think is missing, but we’ve engineered it so it could become more than that. “The Gadget Shop started off as one shop in Hull and that was about doing something different around products and addressing a market that wasn’t being fulfilled at the time.